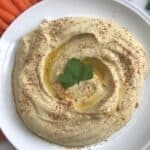 Lemon Garlic Hummus is the creamiest and most delicious snack that can be eaten as a dip, spread, or even with a spoon! As I’ve previously described my love for hummus, I’m here to announce that I’m now even more obsessed than I have ever been before. It is hands down my favorite spread, dip, and even condiment because I put that issssh on everything. I’ve told everyone who knows me that I want there to be a hummus bar at my wedding because I love it that much. My friends always joke with me that I could take a bath in it, and honestly, I probably could. 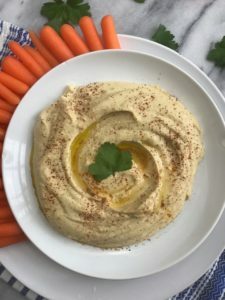 Hummus is one of those foods that I can (and do) eat every single day – I mean it is obviously deliciously good, but its also so easy to make, keep in the fridge, and pull out for whenever hunger calls. Plus there are so many different flavors you can add to it. I posted a beet hummus recipe a few months back, and it is made with fresh beets so the color was incredibly vibrant pink. 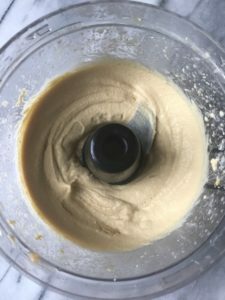 I’m excited to start creating some new fun hummus flavors and sharing them with you all, if you have any recommendations let me know! For this hummus, I did something mildly tedious but I really, really think its makes a difference. I hand peeled the skins off of every single chickpea. This is technically an unnecessary step, but do you see the creaminess of the hummus below?! Although the flavor will be the same, you cannot get that texture if you leave the skins on! I highly recommend doing it. All you need to do is pour a can of chickpeas into a strainer, rinse them off, and slide the skins off with your finger. It’s actually pretty therapeutic and I enjoyed it probably more than I should have. 1 15oz can of cooked chickpeas, drained + rinsed, skins peeled off. 1 1/2 tsp. fresh minced garlic. In a food processor, blend chickpeas, tahini, lemon juice, oil, garlic, and salt. Taste and adjust seasonings per liking. Pour into bowl and top with paprika and oil.